My heavens! What a treat to be invited to Yukon Blade Grinder land. As THE man of the cloth, I find it quit humbling to have an opportunity to sing the praises of one Howard Ungerleider. So rich is his body of work. So diverse a resume of accomplishments and achievements. One could simply spend days upon days documenting them...but not me. Think about it. It's been written the entire world was created in just 6 days, so I can't give more than this to Howard without feeling guilty. I'm here, as they say in some parts of the world, to get my swerve on and share some thoughts about one Mr. Ungerleider. I traveled all over God's green earth to find the real story. It wasn't easy. As with any assignment with the YBG sometimes you just gotta go with the flow. In the end, it was all my pleasure. Ungerleider was born in New York in 1952 and moved to New Jersey when he was 12, spending his teens in Paramus. He credits his father, a former drill sergeant in the military, with instilling a strong work ethic in him. Success comes from the sweat of our brow, and sometimes from a boot in our rear. That gave him the tools to not be afraid to get his hands dirty. Kudos to Dad--job well done! His grandfather played mandolin with the New York Philharmonic, and Howard taught himself a little piano and guitar, which he played in a couple of local bands. Meanwhile, always cruising for the action and the next step up the corporate version of Jacob's Ladder, he volunteered at his high school theater where he first started running lights. He went to what is now Monmouth (NJ) University studying theater and drama right up to the moment when a prank got out of hand and he was shown the door. “It was stupid,” he laughs about the reason for his dismissal. No worries my son...you're forgiven! We all fall short. For example, the Yukon Blade Grinder didn't even pay the fuel tab for my papal jet to go interview Geddy and Alex. The bill is in the mail. But before his dubious exit, he was on the student council, where he booked concerts and once worked with a New York Agent named Sean LaRoche. So he started showing up at his New York office, thinking if he met him he’d get a record contract for his band. All in God's good time my son. LaRoche’s secretary kept putting him off, saying he was out of the office, at lunch — whatever — to get this kid to leave. After three weeks, Ungerleider figured out her schedule and marched into LaRoche’s office when she was out. LaRoche, who couldn’t believe this kid had gotten into his office, was even more flabbergasted that he was asking for a record contract. That's using the brain the good Lord gave us all Howard. From dreams to a bowl of dust? NOT for Howard!!! “Listen, there’s probably 20,000 bands out there and only one will make it, and it won’t be yours,” LaRoche told Ungerleider. “Now do you want to learn about this industry or do you want your life to be a pipe dream?” Undaunted, Howard was ready for his real "education". LaRoche wrote some names down for him and sent him out the door. Perhaps crestfallen, but not deterred, it was his ticket to his job as an office boy making $75 a week for another agent, Jeff Franklin, then one of American Talent International owners. As always, Howard was able to learn what he needed to step up to the next level. He went from getting coffee to working in the mailroom, with Franklin seemingly screaming at him all the way. He got his big break when he overheard Franklin chewing out a room of agents because they couldn’t get a gig for Fleetwood Mac at a $3,500 package, with an extra $750 for the opening act. On the way home, Ungerleider stopped by Fairleigh Dickinson University and sold the deal to them — for $8,750. The applause of metal heaven reign on you my son! Now an agent himself, Ungerleider worked with Deep Purple and Ronnie James Dio and did very well. “I developed a tough reputation, and they would often send me to collect the money from a gig,” he laughs. So tough in fact, he was the inspiration for the immortal tour manager "Ian" from the movie Spinal Tap. He's the one who made sure the motel accommodations were right. He made sure Alex had mandolin strings, and the band had bread that needed no folding. But as he traveled with the bands, they would always ask him what he thought of the show. He would be blunt. “Sometimes I’d point out that there was no ‘show’, just a band playing music.” He would make suggestions, particularly about the lighting, and the band would have him talk to the lighting director about his ideas. This blossomed into a moonlighting gig as a lighting consultant. As the crazy overflowed at the agency, with partners fighting and threatening legal action against each other, Rush needed a tour manager for their first U.S. tour, and the prospect of working for a band looked good. In the summer of 1974, he was sent to Canada by his company to help a new band as they started touring regularly. 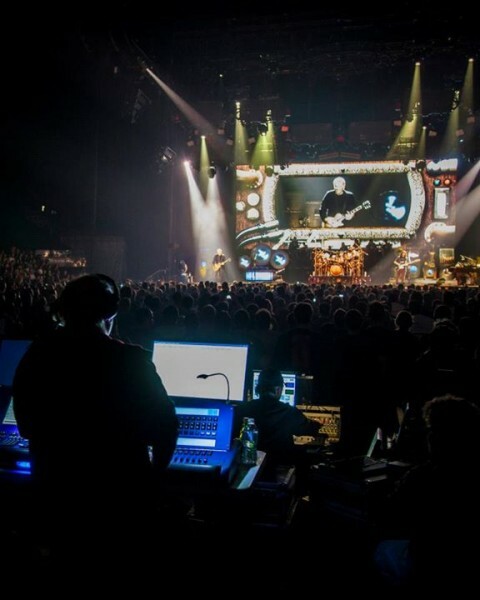 That band was Rush and Ungerleider has played a crucial role in the success of their tours and production for nearly 40 years. 40 years! That's Moses territory right there, and Howard was certainly traveling the Promise Land in America. For so long he wore the Tour Manager and Lighting Design/Director hat and has been on the road with Rush for every tour except the Roll the Bones tour. From the early days opening for Kiss and Aerosmith, to the breakout 2112 shows, the blockbuster success of the Moving Pictures tour, introduction of lasers on 1984's Grace Under Pressure tour, triumphant return and astounding South American audiences on the 2002 Vapor Trails tours, to the Time Machine, and the current R40 tour, Howard has been instrumental in the look and feel of the band's performances. While the band provides the all important soundtrack, Howard sets the scene and creates the drama with precise and powerful lighting and video cues. He is an indispensable member of the band--thus says you-know-who! One of the great perks of being a Yukon Blade Grinder correspondent, and the voice of God on Earth, is that I get to meet so many wonderful people. Geddy and Alex were next on the docket to meet for this homage to Howard. Flying into Toronto, admiring the skyline and after eating a healthy meal of poutine, I got the chance to visit with the two and get their thoughts on such a long a happy union with Howard--so rare to see such commitment these days. Little did the two men know that I've been a fan since day one, myself seeing them live countless times (Vapor Trails is my favorite album, though Totem is my favorite song). They were surprised to see me in my VT shirt. Geddy and Alex, so nice for you to take time from your busy schedule on this tour break to speak with me. You're big fans of the YBG I see. I'll bet you didn't know I was a big fan of your music. Geddy: I remember the "Sermon on Mt. Nerd" that was telecast all over the world when you were denouncing Vapor Trolling. Thanks a lot big guy...I mean Frank. No problem, no problem my sons. Tell me what are some of the things you love most about Howard? Alex: Truth be damned..er sorry...I mean, I've been at some of these events and many times it's being told in a way that I don't remember. But who cares they're great stories. Geddy: Absolutely the truth. Howard is gifted in that department. Bring you to tears with his humor. Geddy: My favorite is when he worked as tour manager for us when we opened for Blue Oyster Cult. We had a problem getting all of the money owed us. So, he said he went into their dressing rooms with his beloved pet ferret. What was his name Al? Alex: Slinky. He kept this thing on a leash and walked it every day for Christ's...er I mean Pete's Sake. Geddy: Yeah. Well anyway. He went into their dressing room with Slinky and put him in Buck Dharma's pants. He said if he didn't get the money he was gonna tell slinky to bite his cod off. We got paid, but I doubt that story is true. Alex: I dunno Ged. We only lasted two shows with them after that, then Kiss came into the equation. No great loss, but I think it played a hand somehow. Nice. Loyalty is a quality God admires. Tell me another...these are great. Alex: There's the "Big Gulp" incident at Rochester. I couldn't believe that one. Geddy: Well, Rochester was the worst horror story. When we played there at the auditorium and the show was about to start. As Howard called the house lights and the place went dark, a huge Big Gulp came over in the air, flipped upside down and doused the complete lighting board and we had to do the whole show that night with just spot lights only because all of Howard's consoles, including the back-up, were flooded with ignorance and a Big Gulp. After that show, he started to do things a bit differently. For ten years he had that ferret on a leash, sniffing out trouble before it happened. Alex: Nothing but spotlights that night. I still think it was Howard's Big Gulp though. Geddy: But, the show was one of our best shows. Howard even came on stage to help sing Limelight. Alex: He's got a really good voice. Surprising. He performed a miracle that night. Literally turned water in to wine. I'm sure you're familiar with that exp<b></b>ression. Right Frank? Oh yes. One of my favorite stories. So, where's the ferret now? Is it dead? Alex: Oh yeah, long gone. I think Slinky's been stuffed and is on Howard's tour bus for good luck. Geddy: Been working like a charm I must say. Wow. Yukon Blade Grinder readers will love that one. Tell me the other thing you love most about Howard? Alex: The other thing is that no one, and I mean no one, can get a room full of people drunker, quicker than Howard Ungerleider. Alex: That's a good one. Though when I reflect on the crew party after the Clockwork Angels tour he made these drinks called "Jesus, Joseph, and Mary"...three levels of awesome sauce right there. It fills my heart with joy to hear such things. Beautiful. In closing, when Howard reads this edition of the Blade Grinder, what would you like him to know about how you feel about him? Your career is coming to a close...what would you like to say? Alex: Thanks so much for being there Howard. All of this happened because you were a part of the team. We learned so much together, and been through so much life. Good times and bad. You really are the 4th member of the band. We love you. Geddy: Howard. Herns my man. You're the best. Come live in Toronto so I don't have to see Alex so much. I need an excuse to get away sometimes. Touching. Very touching to hear those words. I remember flying back to the Vatican with my head swimming about this story. How could I wrap up a story such as this with a fitting tribute to the best lighting director the planet has ever seen? Well Howard, it's been said that when God was making our world the first thing he did was create light. However, I have a feeling if God was tired that day, or was otherwise occupied and needed someone to step in and make light a reality---he would've called you. Thank you my good man...from all Rush fans! Edited by Tombstone Mountain, 16 July 2015 - 07:19 PM. Is all of that about Howard true? I didn't know he was from New Jersey. but I wish someone had said that to me forty-five years ago. Well, kind of. Not exactly bands, but I did have stars in my eyes. TM, I don't know how you do it, but I admire your creative ability! And so does "Frank". He's sending you a commemorative medal from the Vatican. And his copy of Vapor Trails to give to Howard so he can have Rush autograph it. Interests:Sci-fi/fantasy shows and books, reading, hockey and Rush of course! This is so great, you really outdid yourself Tombstone I saw Mr. Ungerleider Monday night after the concert talking to some fans as my sister and I walked out of the show, he was smiling and happy. I thought Clockwork Angels had a fabulous light show but R40 was phenomenal. Fantastic Duff. Out of this world. Every time you bring a new YBG, I think, wow that's his best work. Soooo funny, and interesting!! I love the photo of the Pope in the Rush robe! Some pictures i can't see. That's one of them. I'll go on IE and see if it comes through on that server. i hope Howard sees this. He'll love it. "Totem is my favourite"... Genius!!!!! How did you do the picture of Geddy reading the YBG on the plane? You really ought to send that picture of young Frank to Francis. Knowing him, he'll love it. Might even call you up. He likes to do that type of thing. The best is the one of him with the Neil cap on. Neverland Ranch is used to having vigils outside its gates. Back in the day it was a magnet for creepiness and hero worship. Even when Michael Jackson was alive, fans would show up to light a candle in honor of their beloved “Moonwalker”. Today, the Yukon Blade Grinder goes straight to the top in terms of vigils, votive candles, and the ultimate show of Vapor Trails support. With the elements of the story changing every day for the worse, a cheerful outcome seems impossible regarding the “Spirits of Neverland Ranch” case. Containing the most bizarre of cultic practices involving cannibalism, stone formations, and oppressed women on animals, one normally turns away from such evil. Not this media monolith! The Yukon Blade Grinder is fresh from an enthralling two-day interview with the Seven Cities of Gold dancers, and now ready to get back in the game to confront reality. Now dear readers, the story has reached spiritual heights. Truth be told after spending time with the Seven Cities of Gold dancers, the YBG could use a little forgiveness. In most instances when dealing with the Yukon Blade Grinder, people adapt accordingly for a chance to share their story. However, when dealing with the most recognized living religious figure in the solar system, the Grinder will always make an exception. Summoned to Vatican City by our German and Italian desks, the Yukon Blade Grinder is ready to report the news. Hundreds of thousands crowded St. Peter’s square, and waited for the word. Countless beach balls flew over the boisterous crowd. Flags from every corner of the globe were waving in anticipation of the day’s message. Even soccer anthems permeated the air. Spectacles become markers in history, always in the corner of our collective memories crying out “I was here” when Pope Francis brought the wood to Rush Goober. The Blade Grinder was on the scene as it happened. Known as the “Peppy Pontiff”, Pope Francis has great warmth exuding from his soul. He’s a real people person. He loves his job and always ready to get out amongst the folks. As the doors opened from the papal balcony, he made his grand entrance. The crowd erupted into a frenzy, showing the love to the their leader. Calming the crowd the Pope issued the cue for the sounds of ringing church and tubular bells. It sounded awfully familiar. “Today, I come to you with a message from the peak of Mt. Nerd. Listen well, my friends!” The Pope spoke with authority, then compassion. “To the men who hold high places—you must be the one’s who start. You need to mold a new reality, closer to the heart. The blacksmith and the artist reflect it in their art. Those words hung in the air, creating a symphony of nouns, verbs, and adjectives. The Pope smiled and clasped his hands together. He continued. “The philosopher and the plowmen—each must know his part. Sowing new mentalities, closer to the heart, YEAH, closer to the heart. Let me be your captain. I will draw the chart. The Pope stared out into the sea of humanity and plowed on. “As I’ve said before, I’m not here to judge anybody, but to share boundless love. However, there’s a tipping point, even for me. These fans have endured decades of slander, bullying, and intellectual dishonesty from all angles of society. They’ve never been popular, and have always reminded of that fact. They’ve been the target of scorn and rage from those who think they’re “better” than everyone else. No more. We honor the Rush fan. Trolling Rush Fan websites, causing hate and discontent is banned. To the Rush fan, you are no longer detached, no longer subdivided. The dreamer. The misfit. You, who are so alone—come unto me and we’ll listen to Vapor Trails together.” The crowd then responded with their own version of YYZ, in a chant that would make most Brazilians jealous. Jack, relax. Get busy with the facts. No zodiacs or almanacs. No maniacs in polyester slacks. Just the facts. You gotta kick some gluteus max. It’s a parallax, ya dig? When you move around the small gets big, it’s a rig. Don’t be afraid of little abstractions. You can’t get satisfaction from the facts. You’d better run homeboy—facts a fact from Rome to Gnome boy! Spin the wheel. If the dice are hot—take a shot. Play your cards. Show us what you got—what you’re holding. If the cards are cold, don’t go folding. Lady luck is golden. She favors the bold and that’s cold. Stop throwing stones—the night has a 1000 saxophones. At that point this reporter, along with my friends from the German and Italian news desks, sat on the edge of a fountain, watching the crowd of people disperse. The wind whisked around us, spreading its cold chill and blowing litter hither and dither. Night slowly approached and we were alone, wondering how a tiny dwarf incarcerated in the Santa Barbara jail could manage to piss off the Pope. As it turns out there were many reasons. Saying our goodbyes, we felt the same as before the Pope’s sermon. Confused. Flying out of Rome, this Yukon Blade Grinder reporter was still scratching his head. Now, Judge Hhang M. Hi looms on the horizon. Goober better hope she’s in a better frame of mind than Pope Francis. Hard to believe almost two years already have gone by! In terms of what I want to occur with each one, what you said is exactly what I want. Thank you Grey...it means a lot coming from you! I must say thanks to x1yyz for the images cooked up. She's always working on something awesome, or is so helpful to me in achieving the absolute right pictures. Thanks big time Sharkchick! You have amazing talent!